We are be social creatures. The elements we’re made of hunger for specific kinds of relationships in specific contexts. 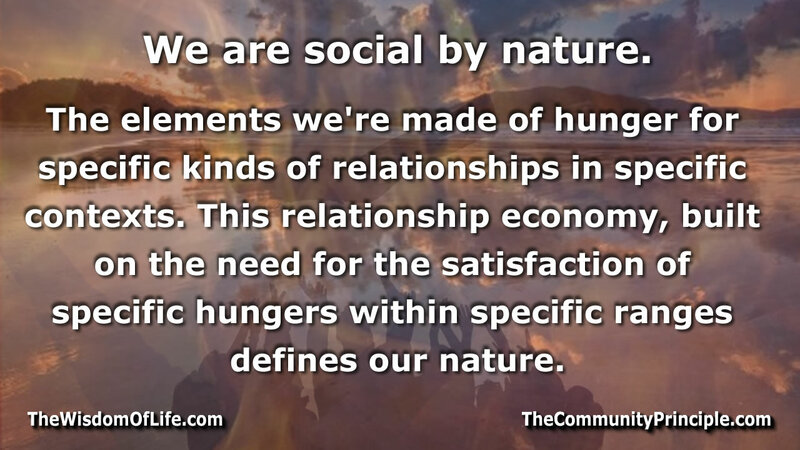 This relationship economy, built on the need for the satisfaction of specific hungers within specific ranges defines our nature. Every atom with which we are constructed has specific hungers for specific relationship. 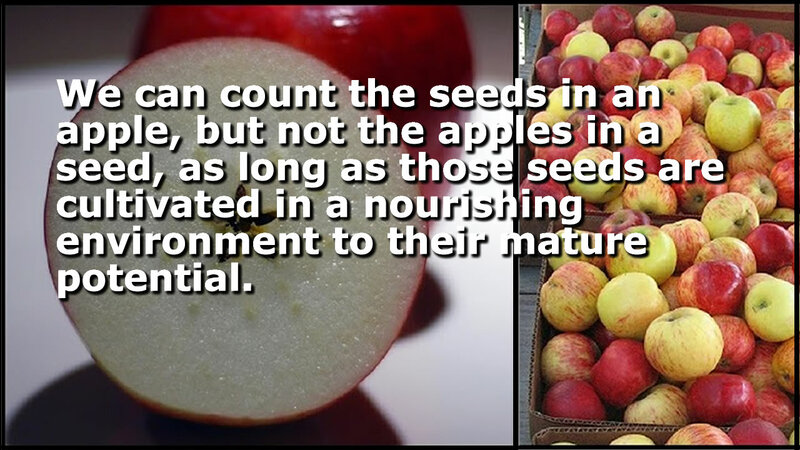 Our nature is social to the core, our biological structure reveals this at many levels. Every cell and organ depends on the others. 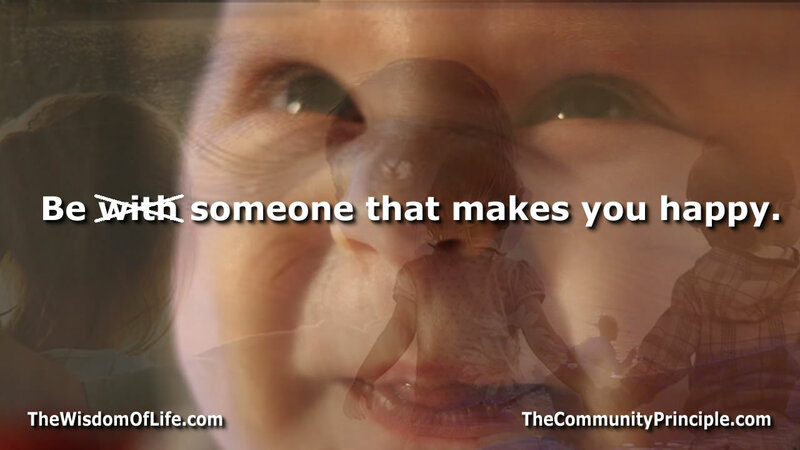 It is the community of social relationships that defines us. When we cultivate the availability of, and tend to servicing a certain nourishing order of things, we can be satisfied; conversely, if we violate this necessary order we suffer from instability – and if a critical nourishing relational pathway on which we depend is throttled or destroyed we can lose the integrity on which we depend to exist as a biological being. Our brains are built on the same social principle. In terms of perception, contrary to some beliefs, we are not primarily logical creatures that are also social and emotional. Even though we appear to use logic as the currency of social influence, our peculiar use of logic as a method to persuade is a polite fiction at best. The evidence does not suggest logic is an effective tool, except in social circles where logic is valued highly or some corresponding social-emotional connection is associated with the logic – and this is the point: “Social-Emotional Bonds” are the key. The fact that our emotional and social traits trump logic is born out by the evidence in many ways. One example is the way we sincerely and passionately disagree with out-groups in ways that conveniently agree with and support the validity of our in-group. This difference is despite the similarity of our basic biological sensory and processing equipment. This suggests something other than biological differences as the cause. Of far greater weight than our brain’s capacity for logic is the emotional-social aspect of this fatty organ sloshing around our skull. When our social hungers are either wounded of starved, particularly at critical developmental periods, all kinds of pathologies can result. Addiction may be one of those pathologies. Here is an interesting TED talk by Johann Hari about the potential causes of addiction. The whole world starts the lens through which we see it. Charles Swindoll once said; “I am convinced that life is 10% what happens to me, and 90% how I react to it.” Some of us look for happiness on the outside, some expectation we overlay on our world. While the outside is of some consequence, it it the inside that shapes most of what we see and experience. The same way a seedling must first develop in the darkness of the soil before developing the strength to show itself to the rest of the world, the soil from which our public identity emerges largely determines what we experience. Happiness is an inside-out journey. A tree simultaneously stretches itself downward into the soil to draw the water and nutrients as it stretches up and outward toward the sky to capture the glow of sunlight and drink from the atmospheric delights that waft past its swaying branches. In so doing, the tree stitches the elements at its disposal together and if they are sufficient, it uses them as a vehicle to propel itself toward its full potential. A tree breaks the prior symmetries of certain structures, not for the sake of destruction, but to reassemble them into its own likeness – in its own form. At its crest, the wave of self assembled organization that is the tree matures to relate with other trees and the creatures that call it home, and to cast its offspring to the wind in the hopes of making even more like itself. Like the tree, we need draw from places of nourishment to realize our potential. 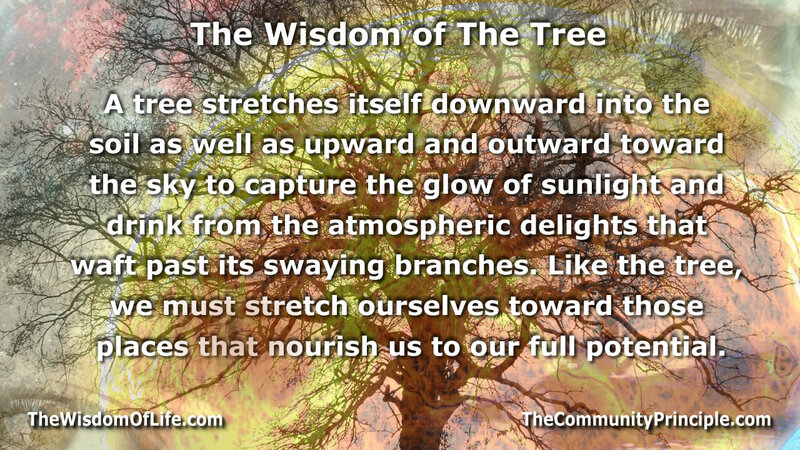 Like the tree, if we do not stretch ourselves to reach those nourishing places, we are destined live beneath the threshold of our full potential. We have some measure of choice in where we stretch ourselves. Let’s make sure these places we cultivate our own assemblies are also those that nourish our potential – that contribute substance and strength to the canopy we all live beneath – this community of life we both live in and depend on. The most profound forms of intimacy are based on relationships where the participants do their best to identify each others needs, and give each other their best. 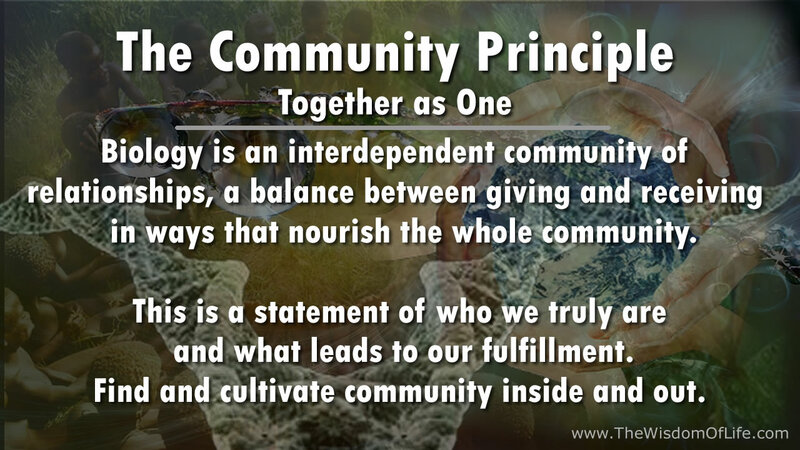 Wealth and strength emerges from the elements of giving that strengthen community. 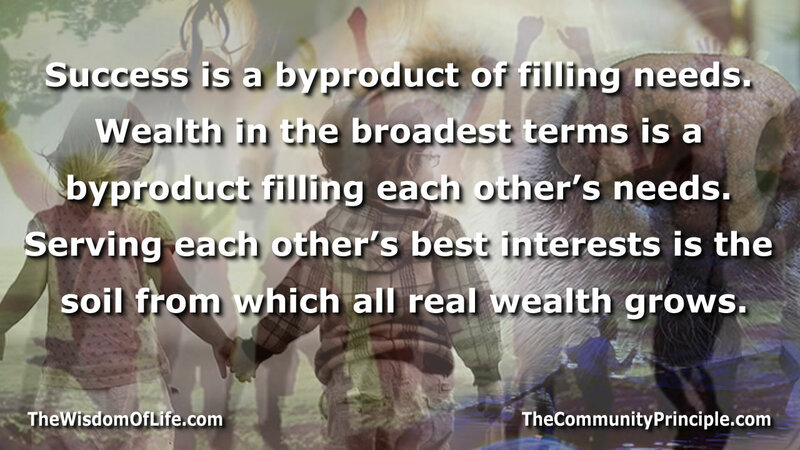 If we consider the fact that a thing as simple as a pencil could not exist unless many persons with many skill sets combined their gifts and shared we begin to get a picture for how wealth emerges from this community principle. From an economic perspective, we do ourselves no favors by clogging up the flow of values that cultivate each other’s success. 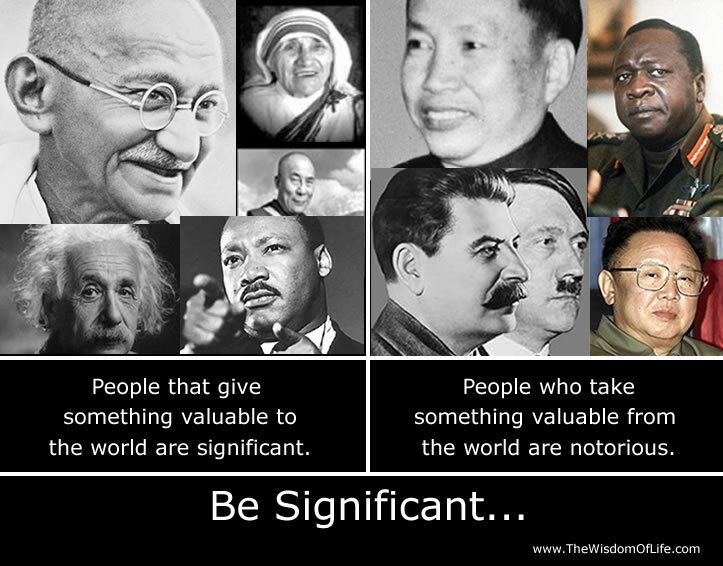 If segments of our culture are aligned around exploitation the result is poverty. A diseased body is imbalanced, as is a diseased culture. Our values are the currency that drives these behaviors. There is great value in the mutual stake in each other’s success. This need for a mutual stake in each other’s success does not negate the unpleasant fact that this organic flow can get ruined by one wayward greedy relational element the same way a forest can burn down on the power of a single spark. Community is strong, but it can be fragile as well. On a personal level trust and confidence grows from mutual trust born of actions that serve our collective needs. We must stand together and act in the interests of the whole biological community we are both in and of in order to realize our fullest, most satisfied state. In this sense, we are game players, not rule makers.